You are sure to enjoy a real holiday in this welcoming family-oriented centre. Breathe the ocean air of the neary beach and take advantage of the mountains that are only 8km away for walking and hiking. Pets not allowed in rented accommodation.. Arrival time from 16h00 to 19h00 . Departure time from 9h00 am to 10h00 am maximum (8h30 am to 10h00 am in July and August). Arrival time from 14h to 19h . Departure time from 9am to noon maximum). This is such a friendly campsite, welcoming and helpful at all times. Also, it is in a beautiful place. The pitch size and the cleanliness of the overall site. Fantastic family run campsite with all the necessary facilities you need. The location is perfect, two beaches on your doorstep as well as the cycle paths. As an observation, the site does not have much in the way of play areas and things to do for children, nor does it have a pool. So for us as a couple without children, it was perhaps better because the site did not have that many young children and was therefore a bit quieter that other sites with lots of children's activities. I would not have liked the site so much had I gone there with our children, although the proximity of the beach somewhat makes up for that. The site is well maintained, and the facilities are good, the toilet block is almost new and of a very high standard. The two ladies who are the face of the reception are especially helpful and friendly. Every plot has a tap, but it's only a push down sink type and you cannot connect to it in any way. Okay to fill buckets or similar by keep pushing down the button. 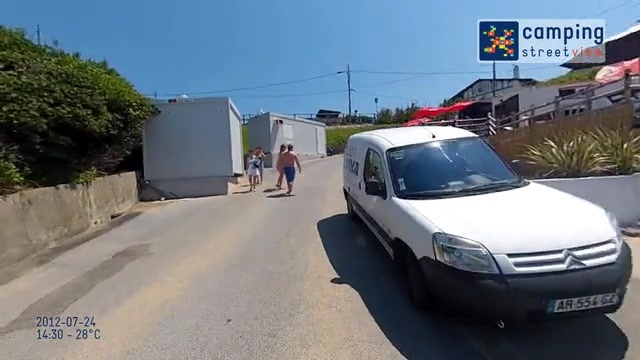 A nightmare for motorhomers who have to fill their tank because you have to drive off the plot to the service point at the entrance and fill your tank from there, by means of a 6 euro token. Roller Barrels are the answer because, with patience, you can fill up on your plot by keep pushing down the button, but it takes a while. good sized plot, but a little sloping, as are all the plots throughout the site. Bed could be a little more comfortable, but the mobile home was spacious, very clean, and well equipped. Prefect, clear and very comfortable. Der Spielplatz könnte etwas mehr bieten, Rutsche, Klettergerüst z. B.
Unser Stellplatz war direkt am Zaun zum benachbarten Campingplatz wo es etwas lauter zuging. Die Größe des Platzes war ordentlich. Wasserhahn am Stellplatz war sehr praktisch. Familiärer, sehr nette, humorvolle Betreuung, Angenehmer, sauberer Platz mit viel Grün. Kommen gerne wieder! Das fällt mir nichts ein. Sehr, sehr freundliches Personal, man fühlt sich sehr willkommen, zu Fuß 3 Minuten vom Platz zum Meer, leckere Croissants und Baguette am Morgen, sehr gepflegter Platz, kein Animationsprogramm, deshalb sehr ruhig!! Tolles Preis-Leistungsverhältnis in der Nachsaison. Gemütliche Unterkunft mit schöner Terrasse.